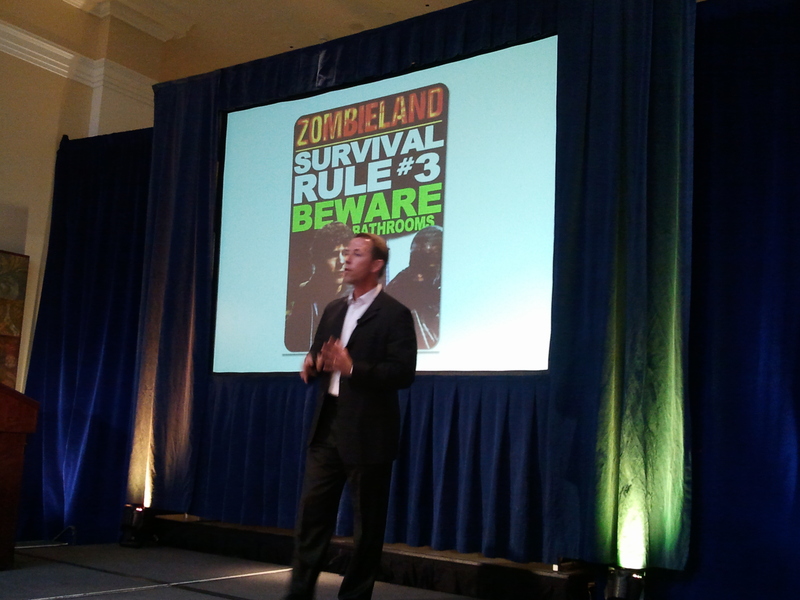 What do speechwriting and zombies have in common? A lot. At least according to Taylor Clark, a 20-year veteran of the U.S. Navy, who spoke about the rules of survival for speechwriting at a recent speechwriters conference. He noted that his tips not only help with writing a speech but also work for surviving a zombie apocalypse. The first rule is about cardio – you have to keep going and going, especially if you’re trying to outrun zombies. If you’re working on a speech, everything must be about the document. As a speechwriter you should either be researching or writing. That means no checking emails and no watching cat videos on YouTube. Rule #2 is all about the double tap. You shoot once, that’s fine. You shoot twice and that’s being thorough, which is needed with zombies. With speech writing, it’s all about accuracy. So check and recheck. Today’s speeches live on social media, and they live on the news. The speech must be accurate. As a speechwriter you also can’t become too attached, which is rule #5. Becoming too attached is not only frustrating, but it can hurt your confidence. “I’ve worked so hard to dig deep and pull out the right words only to have them lined through and taken away,” Clark said. “You have to separate yourself emotionally from the words.”A final rule was to have a go-to weapon. With zombies it might be a chainsaw, a shotgun or a banjo. For speechwriting, Clark said his go-to choice is Evernote, which lets you take notes, sync files across devices, capture inspiration and share ideas. Clark also discussed what he calls the “Trifecta of Speech Perfecta,” which includes paper, feet and mouth. “It’s like a weird paper, rock, scissors game,” he said. Since the majority of speeches are on paper, you will have to print the speech repeatedly. For those who don’t like wasting paper and killing trees, Clark suggested giving a donation to the Arbor Foundation. Printing the speech is critical to ensure proper line breaks and spacing. And by printing it, you can stand and practice the speech, which leads to the feet of speech perfecta. Speechwriters must get up from their desks and stand at a podium and recreate the speech. Clark has a podium in his office and stands at it to edit speeches. Seventy-five percent of readiness in a crisis is making sure you have accurate contact information. I learned this quickly working as a spokesperson for a major police department. I needed to be able to quickly reach colleagues within the city. I also need to reach out to other spokespersons whose organizations also might be involved in the situation. And I needed to reach out to reporters. The key to any crisis situation is readiness. It also helps to recognize that your response will be criticized by people who weren’t at the scene and that the media will quote people who were not involved so you need to get your information out – and quickly. “Speed beats smart every time,” said James E. Lukaszewski, ABC, APR, Fellow PRSA, during a webinar on crisis management. His recommendation is to brief continuously through frequent dispersals of 75 words rather than press releases, which he says only generate more questions and require approvals. Friday was International Women’s Day. 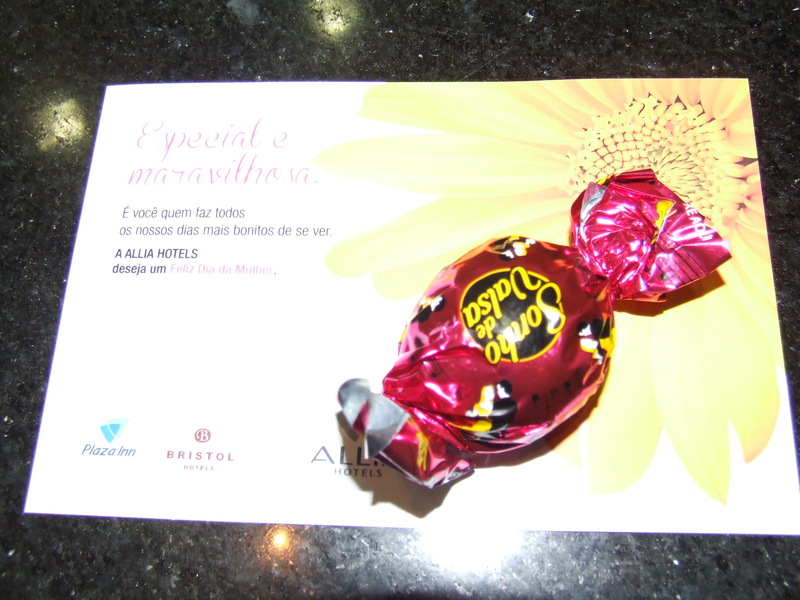 While in Brazil, I was given a piece of chocolate in observance of International Women’s Day. The day is celebrated worldwide and celebrations range from those of appreciation to those celebrating women’s economic, political and social achievements. I was in Brazil on Friday and was handed a piece of chocolate by the front desk staff in celebration of the day. Later, I watched as a large group of women marched down a main street in the city of Belo Horizonte proclaiming their rights. The day before I heard from a woman who spoke passionately about the garden she and the other women tend. That garden is more than a plot of earth with vegetables. The garden is independence. Because of it, the women can feed their families. They sell the extra vegetables and have an income. They use the funds to buy other necessities and to help their children with school. In the United States, Accenture, which conducted Defining Success research, found that the top three qualities women want in a job are work-life balance, positive workplace relationships and job stability. The women in Brazil want the same thing. International Women’s Day is a good day to remind everyone worldwide to celebrate the achievements of women.